A wonderful rare faience terractta roof cat. A fantastic piece in glazed terractta with green glass eyes, originally made to deter vermin & attatched to roof top tiles. 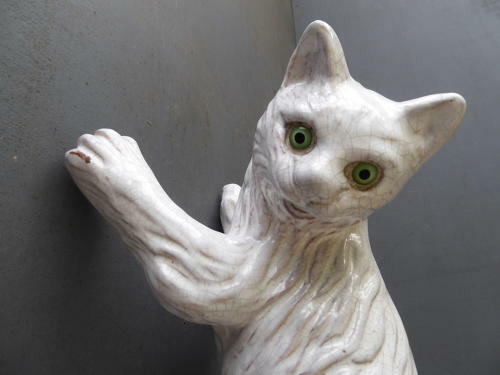 The lead glaze has a beautiful cracked finish & the underside of the cat has a series of holes used for mounting the piece to a roof top tile or post. Not marked but almost certainly manufactured by the iconic Mensil De Bavent Pottery Co of Normandy, France. A superb example with bags of character! Wear commensurate with age, a few minor imperfections but very good overall overall.